With over 25 years of experience, Capital Limousine has been the trusted choice for transportation in the Washington DC Metropolitan Area. Whether you are traveling individually or as a group, or whether your are travelling for business or leasure, our vast fleet including Town Cars, Stretch Limousines, SUVs, Executive Vans, and MiniBuses can accommodate all of your Washington DC transportation needs with the most competitive rates in town. From airport runs, to business meetings, to city tours, and all other services, you can always rely on our professional chauffeurs to arrive on time in clean late model vehicles to whisk you safely to your destination. Our friendly reservation staff is available 24 hours a day 7 days a week to assist you in booking your next trip. So contact us today to experience the royal treatment with Capital Limousine Services! To better serve the growing needs of our clients, Capital Limousine has always prioritized the corporate division for our valuable customers. We offer services to and from all the major international airports in the Northeast and Mid-Atlantic Region. Capital Limousine provides point to point services Washington DC Metropolitan area including Virginia Maryland airports at fixed rates. From the moment you arrive, you will receive top-notch service from one of our chauffeurs who will greet you with a sign at baggage claim or your arrival gate according to your instructions. Your chauffeur will then assist you with your luggage and transport you to your desired destination. With the exception of point to point transfers, all reservations have a 3 hour minimum. Travel time is not charged to reservations in our serving area. Your time starts from the initial pickup and ends at the last drop off. All specials discounted rates offered through Dial a car are subject to availability and can not be combined. 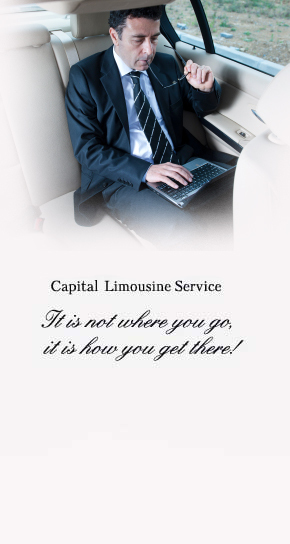 Capital Limousine is the area's major provider of transportation services for all concerts and sporting events. We offer highly competitive rates on all services to and from concerts and games. Call us today to get a quote.